13-year old Ashwini has been battling cancer for the last three years. She has been under chemotherapy treatment and never had the funds to get a bone marrow transplant done. Her parents are flower sellers with a very meagre income that takes care of just the household expenses . Prema and her husband Mahadeva had to make many tough choices since their second daughter developed cancer. With a monthly income of 6,000-9,000 per month, over the last 3 years, they spent months away from home for their daughter's chemotherapy in Bangalore. Mahadeva gave up. They just didn't have any money left. They had two other children too. A heartbroken Prema was convinced by a fellow-patient to go to Narayana Hrudayalaya. “I heard that Narayana Hrudayalaya takes up cases like ours. When we went back, I worked on convincing my husband. We can't give up on our daughter,” she says. At the hospital, they heard of crowdfunding and this is the parents' last hope to save their daughter. 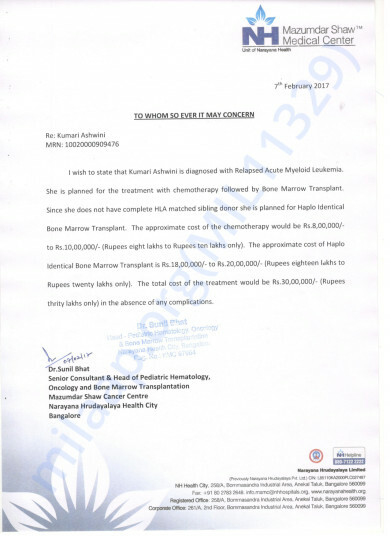 They need Rs 30 lakhs to get her the bone-marrow transplant that can save her life. In these three years, Ashwini's cancer has relapsed twice and with each relapse her parents feel overwhelming helplessness. She needs your help to get the treatment done. 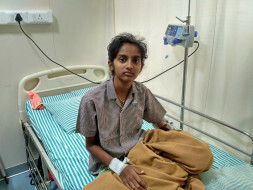 Help Aswini raise funds by crowdfunding in India. Thank you for the kindness shown towards Ashwini! She is at home and doing well at present. She is being given immunity boosting injections after her bone marrow transplant. Her hemoglobin level had dropped for a couple of months but is slowly improving. She will have to get monthly check-ups and injections once in 3 months. We are hopeful that she will make a complete recovery! We are grateful for all the love and generosity extended towards us. Thank you for the wonderful support that you have shown towards my daughter Ashwini. She is doing better now compared to earlier and she has resumed normal activities. It has been close to a year since her bone marrow transplant and is responding well. She has had fever intermittently during the year but the doctors suggest that it is nothing to worry about and she recovered from it quickly. Thank you all once again for the wonderful support that you have shown towards my daughter. Your timely support ensured that she received the best of the treatment possible. I just do not have words to thank all of you. We have some good news to share with all of you today. She underwent the Bone Marrow Transplant procedure on 8th June. She is doing good now and comes to the hospital only for follow-ups. Thank you for all the love and support you have shown her. Your blessings and support gave her the strength to fight cancer and return victorious.